Mid-lesson at Trestle. PC: Teresa Edgar. For most of us, resort skiing is over, and it's time to look at spring and summer sports. But for some ski resorts, the conclusion of snow season doesn't mean closing up shop. Instead, it means retrofitting chairlifts with bike attachments, switching out the ski rental equipment fleet with a downhill bike rental fleet, and setting up miles of trails to prepare for bike park season. 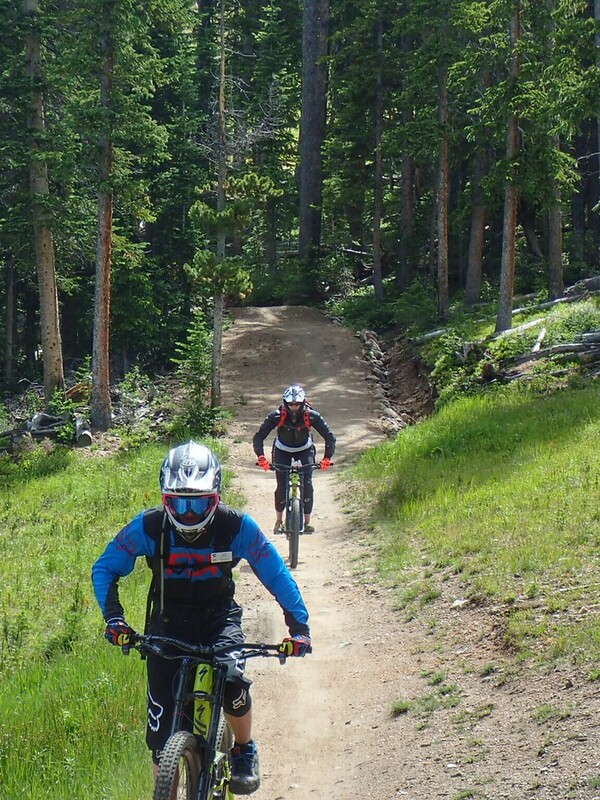 But if you're new to the sport, and even if you're not, downhill biking can be incredibly intimidating. Unless your self-preservation instincts are non-existent, flying down a ski slope on two wheels with the possibility of encountering large rocks, roots, berms, and jumps is pretty scary. But it doesn't have to be. Even if you're a pro, there may be things about bike parks that will surprise you. 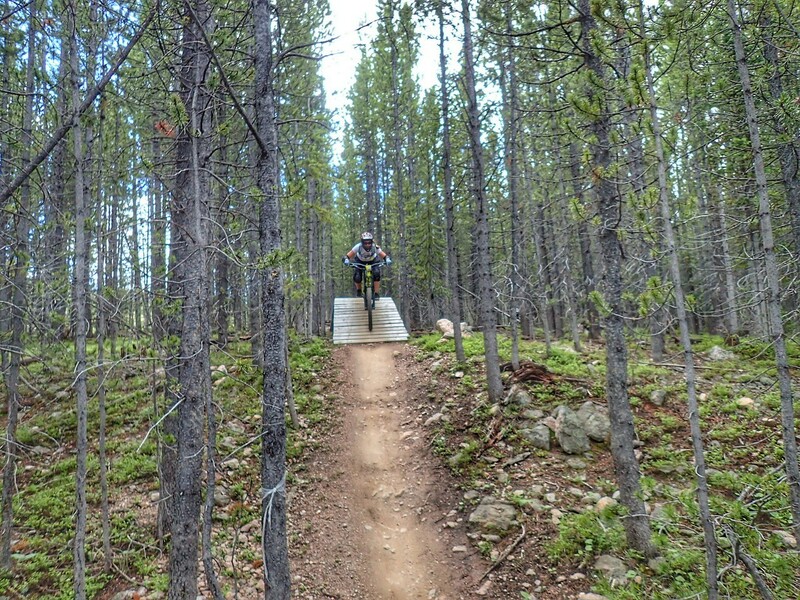 Learn more about what it's like at the bike park from a fellow beginner, and add a trip to one to your to-do list this year! The trails are just like your average single track. 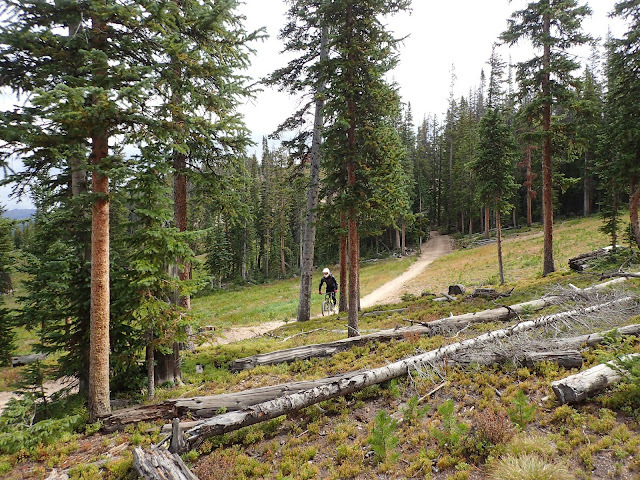 Though you'll see trees, roots, dirt, and rocks like you would riding on trails in parks and forests, generally, the similarities between cross country mountain biking terrain and bike park terrain end there. Bike parks feature purpose-built trails with man-made features that flow well from top to bottom. The terrain is built specifically for mountain biking and includes trails only used by downhill mountain bikers. And speaking of hills, when you're at the bike park, down is pretty much the only direction you're going. When I got my rental bike at Trestle Bike Park in Winter Park, Colorado last summer, I couldn't figure out why the seat was set so low. How was I supposed to pedal? Turns out, in downhill biking, there's little to no pedaling involved, and for the most part, you don't sit down. So it's best to keep the seat out of the way when you're tackling berms, table tops, wooden features, and everything else you'll find at the bike park that you won't find on your local trails. You don't need to rent a downhill bike. You can take your cross country mountain bike and helmet. Ten minutes on bike park trails made it clear why the cross country bike I have at home wouldn't cut it. Downhill bikes are built to take a beating because generally, you're supposed to tackle obstacles, jumps, and turns at high speeds. 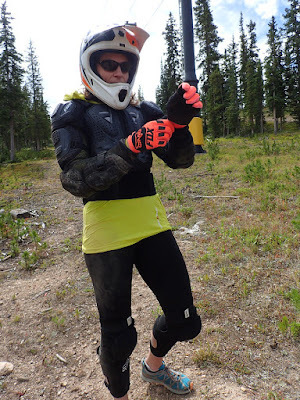 I was surprised at how heavy my rental downhill bike was, but the sturdier materials made it possible for me to ride over just about anything without feeling like the bike was going to fall apart. Downhill bikes also feature disc brakes, full suspension, and beefy forks with more travel to accommodate big rocks, roots, and other obstacles you might encounter. The tires are designed to handle punishment, just like the bike is; most are wider and have wide rims. And in general, downhill bikes are expensive, but I wouldn't trust a cheap bike on trails like those at Trestle in a second. Finally, there isn't a chance you'd want to take on bike park trails with a standard bike helmet. At Trestle, my rental package included a full face helmet, a padded jacket, gloves, and knee/shin pads to protect myself. It might seem like overkill, but after taking a spill going around a corner, I was happy to have all of that gear on. Downhill biking isn't a serious workout. After all, you're just riding down hills. When I ski, I expect my legs to be tired even though I'm not actively working to make downhill progress. Similarly, with downhill biking, my quads and calves were on fire by the end of the day. You're riding downhill, but you're standing up in an almost half squat position the entire time. Friends reported feeling it in their shoulders and triceps as well. But that half-squat position makes it easier to lean into turns and helps you balance. And by keeping your elbows up, you'll feel it in your shoulders, but you'll maintain maximum strength and the leverage you need to shift your weight quickly. Getting your bike on the chair lift will be the easiest thing you do all day. Just like getting on and off the chairlift can be challenging as a beginner skier, I found getting my bike on the chairlift absolutely terrifying on my first trip to Trestle. The lift just keeps moving whether you've got your front wheel settled into the carrier or not, and dropping a bike is lot scarier to me than dropping a ski or a pole! Part of my Trestle lesson included a how-to session on safely loading my bike on to the lift, which was one of the most valuable parts of the lesson. Take a peek at this video before you head to the bike park to see what you're in for. You have to be a pro to have a good time. I'm an intermediate mountain biker on a good day, and my strong sense of self preservation prevents me from doing anything too quickly or taking too many risks. Despite the initial terror, on my first and second bike park experiences at Trestle, I had an absolute blast. So, even if you're not comfortable flying downhill over jumps and around steep corners on two wheels, it's still possible to have a ton of fun. Teresa actually is a pro, but you don't have to be to have fun at the bike park! Like ski resorts, bike parks will have beginner (green dot), intermediate (blue square), and expert (black diamond) runs, and depending on what you're into, there will be plenty of terrain to explore. When I went to Trestle, I stuck to the same handful of beginner and intermediate runs all day. I got familiar with the terrain, which made it easier to get comfortable with the bike and play around with speed. Also, parks like Trestle offer lessons; I took one on my first day and it made a huge difference. Technique, as it turns out, is pretty important! If you're new to the sport, does this make you want to try downhill biking? What other questions do you have? If you've been before, what tips do you have for beginners? We'd love to hear from you!